Head now tilts and pans without winces of pain. Not quite 100% but well on the way. Kinda like the feeling after too much lift. Training returns tomorrow. With some dedication I can salvage a good week. Felt good enough to wash the rain grit off the bike. After four straight days of riding in the rain, a prodigious amount of grit and grime have accumulated. My drivetrain could best be described as "crunchy" sounding. It's a fine sandy grit. Hazmat for moving objects. Way worse for the mechanics than large globular mud. 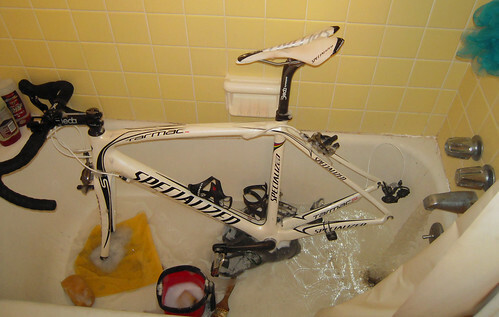 ... should be on one of those "you know you're a cyclist when..." lists.